Our poetic oracle invites you to face mysterious “cabinets of curiosity,” ask about your future and receive whimsical words of wisdom. 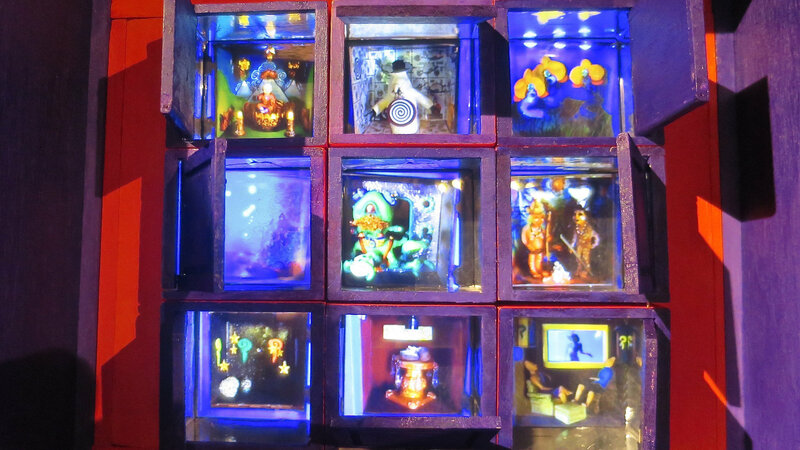 Open one of twenty different “wonderboxes” for more inspiration: each box sparkles with lights, plays sounds, or spins surreal objects. 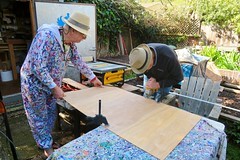 This collaborative art project was created by ‘Pataphysical Studios, a collective of artists, engineers, teachers and students based in Mill Valley. 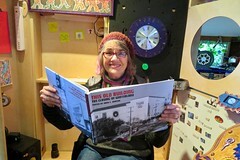 The ‘Pataphysical Slot Machine will be on display at the Mill Valley Library for a month-long exhibit, every weekend from 1-5pm. Here are some of the wonderboxes and other artworks that make up this unique exhibit. 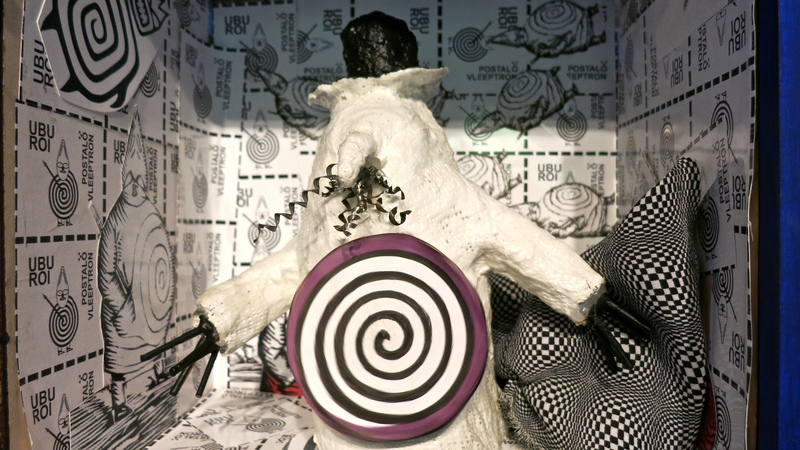 This wonderbox features Père Ubu, a wild character created by french poet Alfred Jarry at the turn of the 19th century. 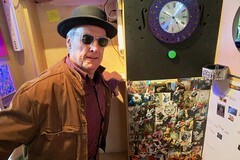 In his new incarnation for the ‘Pataphysical Slot Machine, he is the poetic oracle who gives our guests ‘instructions from the future’ when they press the big red button in front of them. He now lives in the 22nd century, and tweets back words of wisdom through the magic of random access technology, having mutated in a more benign version of his former self. 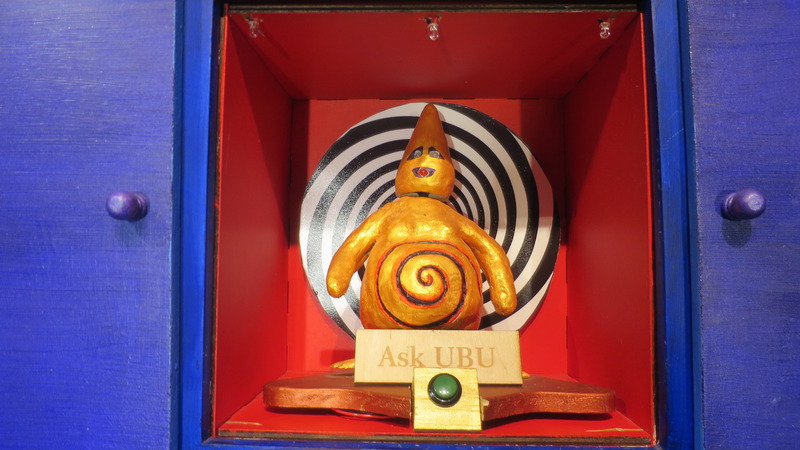 The Ubu sculpture is made of paper clay: its head spins left and right with a servo motor — and its eyes light up with LEDs that cycle through the colors of the rainbow. In the back, a spiral “gidouille” spins back and forth with a gear motor to create a surreal optical effect. This artwork is controlled by an Arduino Uno processor, using this code. 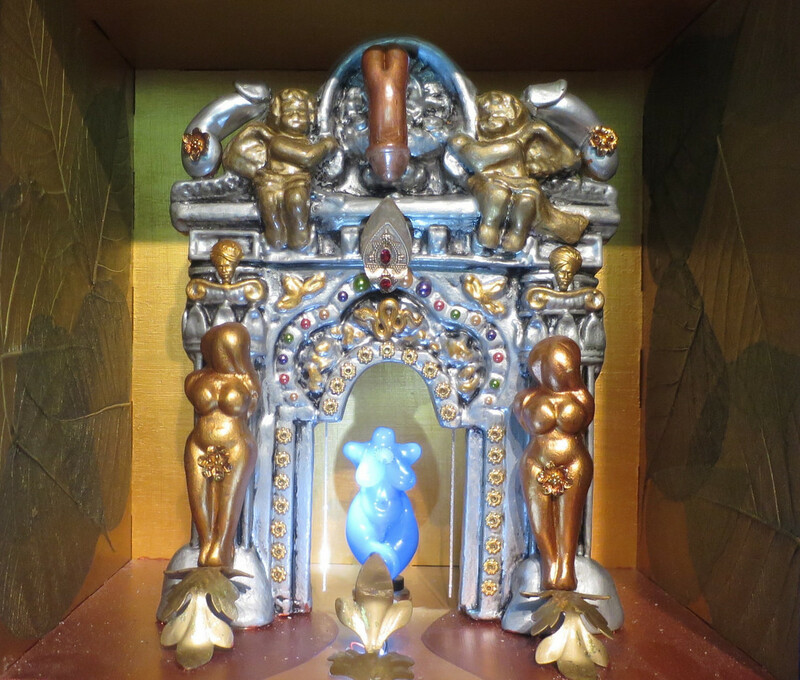 This wonderbox features a baby Buddha who greets you from the base of a mountain surrounded by beaded flowers. It represents the beauty and innocence of a child and of nature. 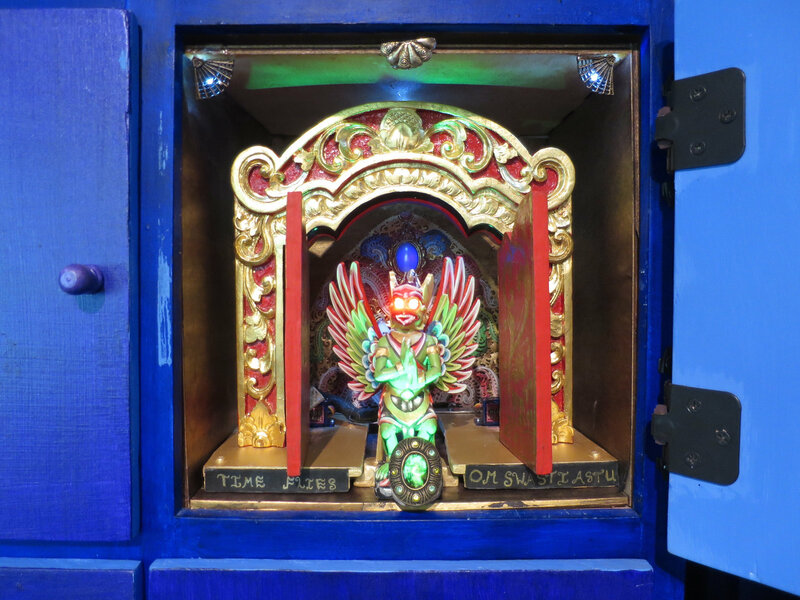 This wonderbox features a poetic robot inspired by the eagle god Garuda. When you open the box, Balinese gamelan music plays as Garuda slides out of his temple, then a cuckoo clock chimes while he flaps his wings. He then shakes his head and sings ‘Om Swasti Astu’ (“God bless you” in Balinese). After a while, he returns to his temple, and the doors close behind him. Fabrice designed this wonderbox and its concept, built the technology and put it all together. His friend the Balinese mask-maker IB Anom Suryawan created the Garuda character and his temple, as well as the character’s voice. Six different servo motors control the motion in this scene, while seven LEDs light up the eyes, wings and temple, in a carefully choreographed sequence. This artwork is controlled by an Arduino Uno, using this code, as shown in this design spec. This wonderbox features two indigenous characters from a mythical tribe called the Bamboodus. These clay sculptures were created by Stephanie Levene, and inspired by a picture book of native tribes called “Natural Fashion; Tribal Decoration from Africa.” The jungle background was designed by Ray Moss (Dr. Raygraph) who lives in Costa Rica. The glowing fire was created by Freddy Hahne, using flashing LEDs. He also mixed the soundtrack, which combines a song by Fabrice Florin with a composition by Tom Disher, originally created for a 2002 Burning Man exhibit called Inspiration Island. This box was inspired by the temples of Tamil Nadu, India. The imagery is purely yoni and lingum, female and male sexuality symbols, and is a celebration of sexuality. 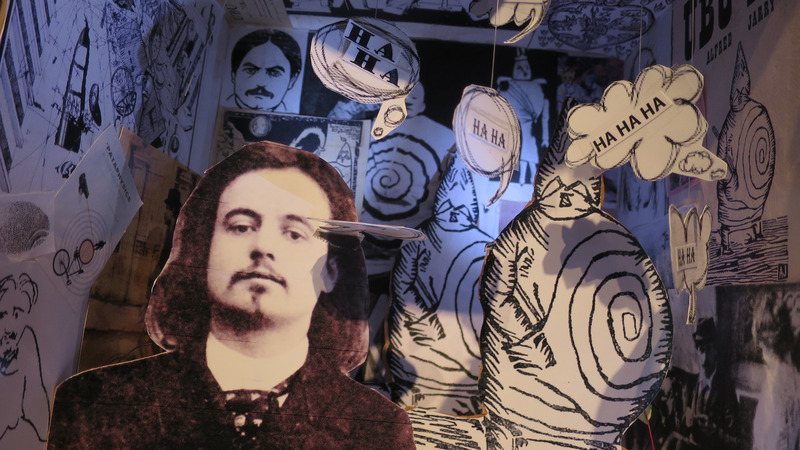 This wonderbox is a tribute to Alfred Jarry, the founder and originator of ‘Pataphysics. He was one of the most bizarre and eccentric characters in the “avant garde” scene in Paris, as well as the author of Père Ubu, an outrageous play that scandalized Paris the first time it was staged. 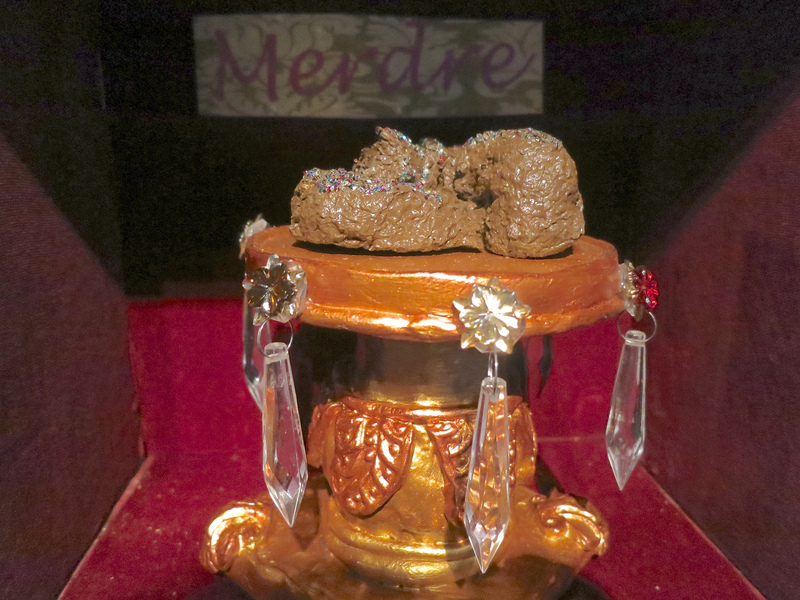 Père Ubu, Alfred Jarry’s scandalous play, opens with the word, “Merdre.” Enough said. 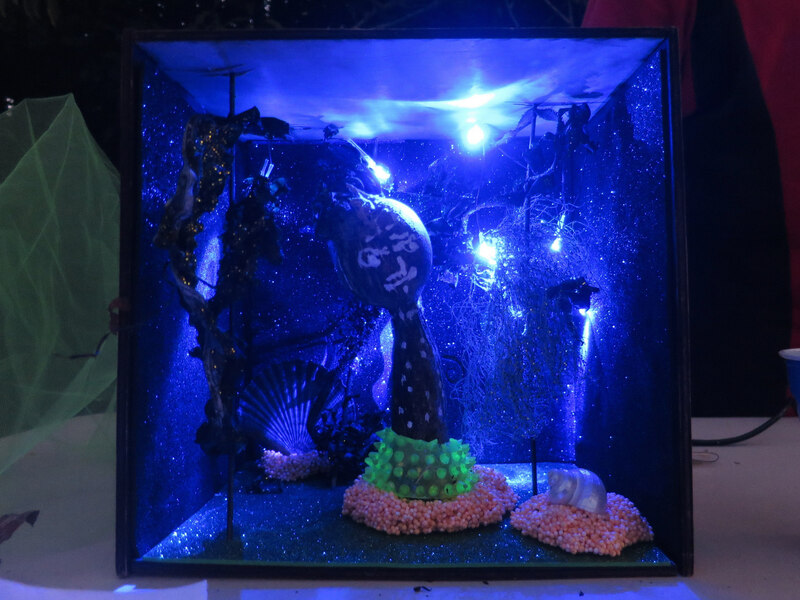 When I thought of how I could make my box different from the others, I thought of seaweed and kelp. I don’t know why. Perhaps because they are so surreal and suggestive of nature’s unimaginable (i.e. “pataphysical”) power of invention. As I beach-combed at Rodeo Beach, a particular bubble from a stinky pile of slimy kelp hollered at me from above the crash of the waves, “Take me!” When I put a face on that kelp, I knew (in that inexplicable the way that circus people do) that its name was “Knobbo.” Thanks to my fellow pataphysicians all for the fun and the learnings that helped me turn my little pata-nothing into a slightly bigger pata-something. 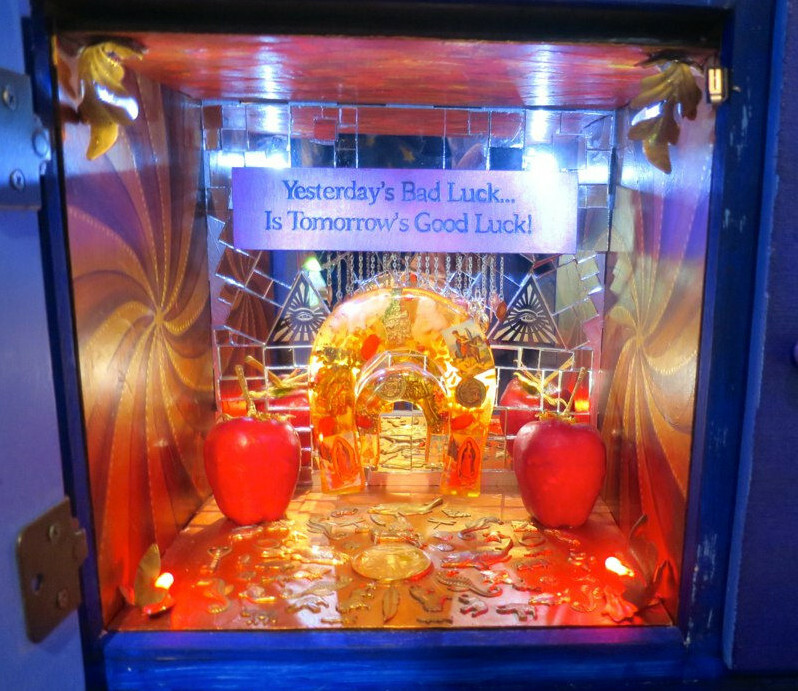 This wonderbox is filled with lucky charms, totems, sparkles and gold. Inside the box, a sign reads “Yesterday’s Bad Luck is Tomorrow’s Good Luck”. The artist was going through some big life transitions while making the box, and as she explains: “As one event would present itself and appear to be a step backwards, it would be followed by a newer fortuitous event that would put both events into a positive light. This pattern repeated itself, over and over and continues to do so. That is life …one door closes, another opens.” The glowing lights were created by Freddy Hahne, who also mixed the soundtrack. 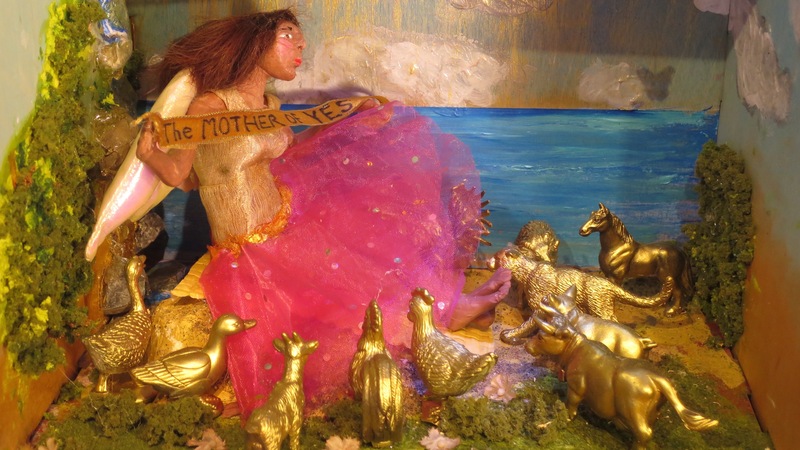 This wonderbox features the “Mother of Yes”, a beautiful elflike creature sitting in a land of abundance, surrounded with animals, flowers and fields — all the things you need in life. The artist invites us to embrace this concept: “Be the mother of yes!” The lights were created by Freddy Hahne, who also mixed the soundtrack. 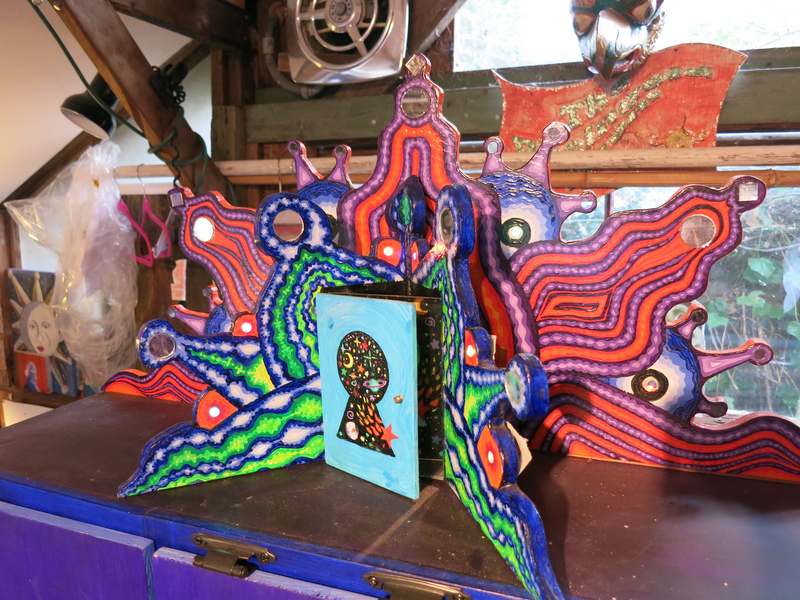 Watch this video of the completed ‘Mother of Yes’ wonderbox. 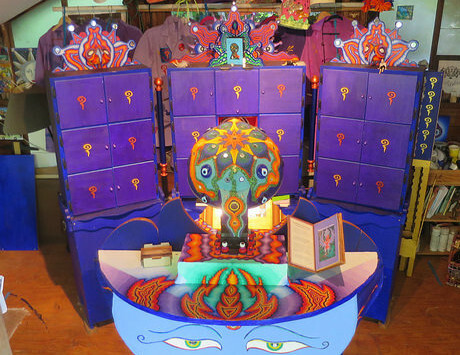 The Metaphysical Plot Device delivers a cabinet-within-a-cabinet solution, providing necessary relief from the chaotic creativity purveyed by other wonderboxen. Justin Hall invites you to understand less by viewing the story of the MPD construction, which details how a video loop played off a Raspberry Pi through an LCD screen fronted by painted dollhouse cabinets could emerge from pataphysical efforts to upend our understanding of entertainment and enlightenment. 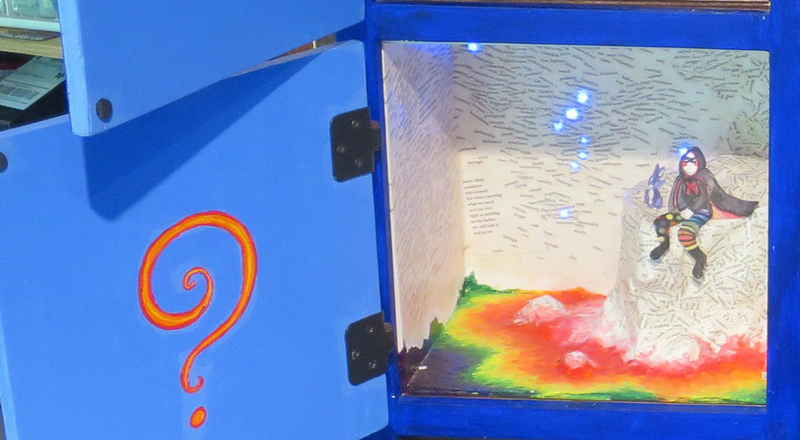 As other wonderboxen wiggle here in nested cabinets, the context for our current reality becomes clear: the Pataphysical Slot Machine is actually part of the Metaphysical Plot Device. 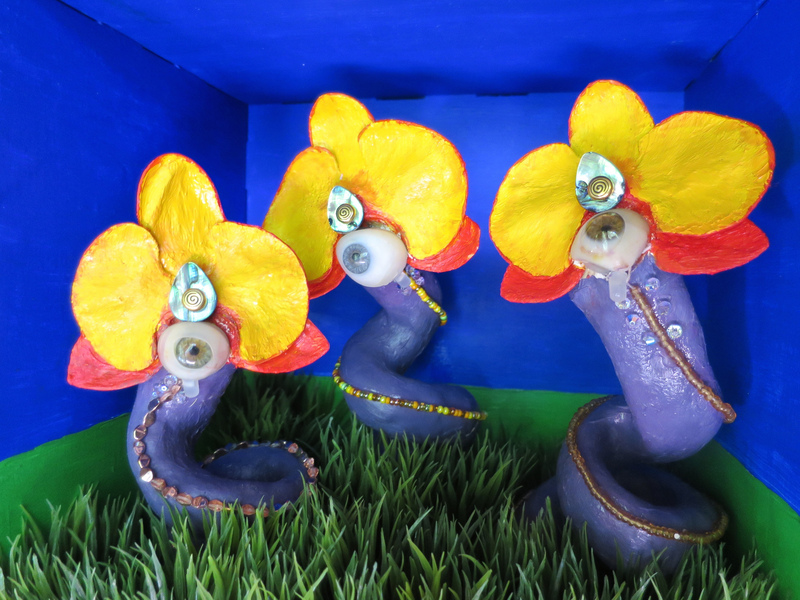 This wonderbox features three ’singing flowers’, each with a surreal eyeball and a pulsing light hidden in their orchid petals, perched at the top of their swirling cobra-like stems. As you open the box, the flowers sing ‘Om shanti’ in turn, a capella, while their lights cycle through the colors of the rainbow. The music is by Shanti & Friends in Kerala, India. This artwork is controlled by an Arduino Uno with a Waveshield sound player and 3 pulsing LEDs. Learn more in this schematic and specification — and check out the code. This wonderbox features a keyhole into a chamber lined with reflective material. Within the chamber are painted cubes and cones and randomly flashing lights. When the box is opened, a voice says “Attention, Earthlings! Do not panic! 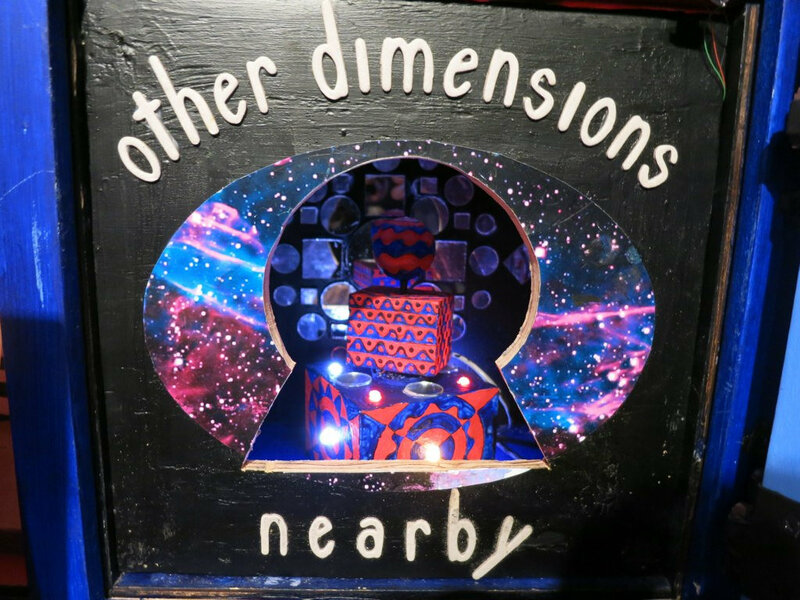 Other dimensions … nearby.” The phrase was adopted from a 1970s video series in which Dr. Rindbrain posed as a Martian anthropologist: “The Martian Report.” The ‘Other Dimensions’ wonderbox was created by Howard Rheingold, in collaboration with Donald Day. Peering through the dark keyhole, you see a symphony of lights reflected from wall mirrors, powered by these RGB LEDs that cycle through the colors of the rainbow. To play the voice, we hacked this sound recording chip, adding a door switch to make the sound play when the box opens, as shown here. 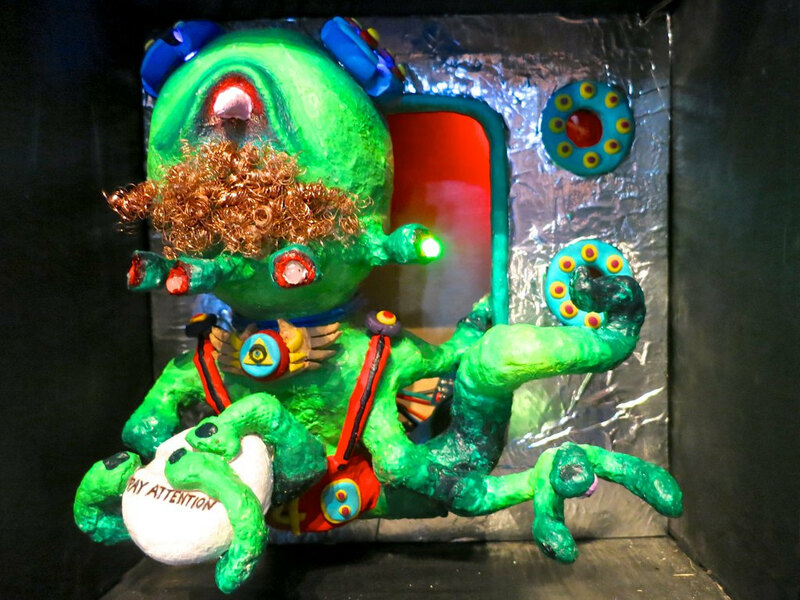 This wonderbox features a three dimensional alien creature emerging from a spaceship, holding a tentacled hand with the words “Pay Attention” inscribed on a pill. The alien’s eyeballs flash through a spectrum of colors, faster and faster, then slower and slower, then faster and faster. Tentacles at the neck also flash. When the box is opened, the alien says “Put your intention into the attention dimension.” The box was inspired by a poster for the rock group The Doors by Rick Griffin in the 1960s. 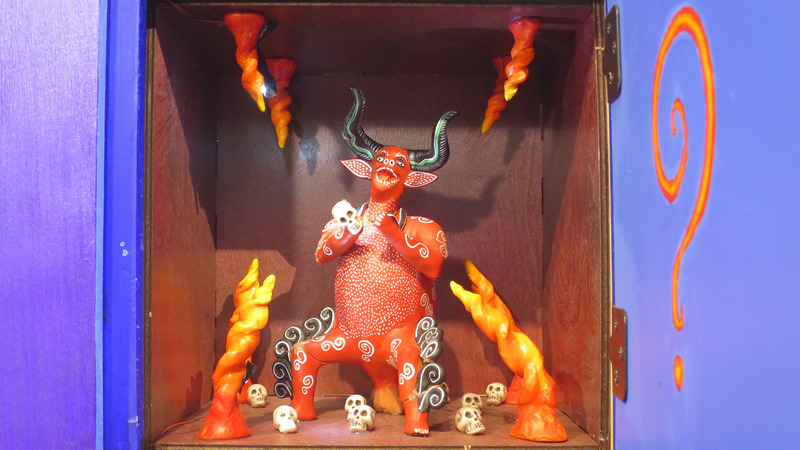 This wonderbox features a red devil shaped like a bull with large horns, sitting in a desolate land, surrounded by skulls. The devil offers to help you find what you want: “What can I do for you? What do you want? 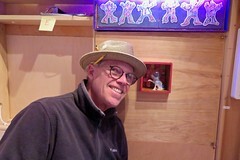 I can do anything you want!” This wonderbox was created by artist Freddy Hahne, who also mixed the soundtrack. The Fool and his companion perch at the precipice that marks either the beginning or the end of their journey. Paralyzed by possibility or locked in transcendent contemplation: the characters are flat; the colors bleeding. Orion peers down from a landscape plastered with pieces of poetry, but not a word is spoken. 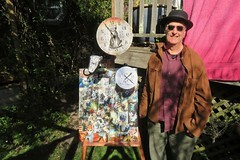 This incarnation of the fool is the mystical cousin of Apocaloptimist, featured in this performance piece. What is a birthday if not the recognition of time passing, another orbit around the sun? 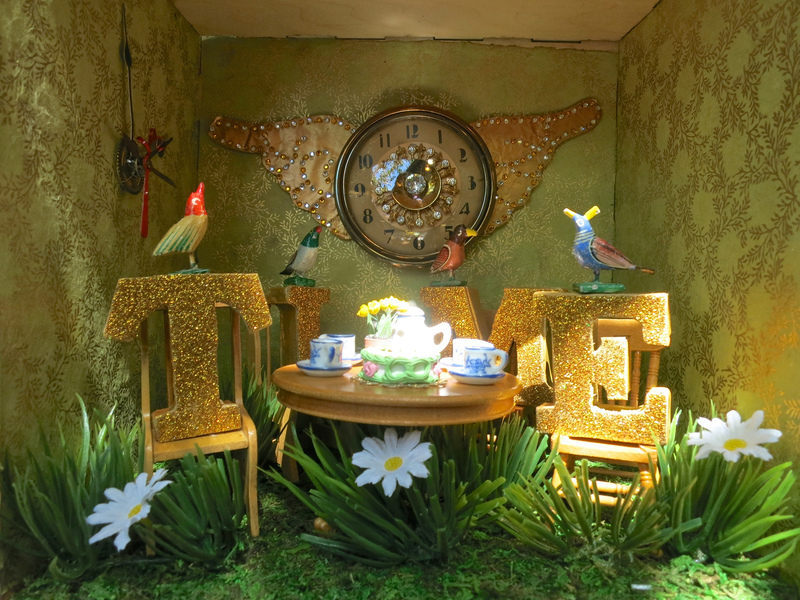 This wonderbox features a birthday party set in a field of grass and daisies representing life and growth, and acknowledges the true birthday celebrant: time. 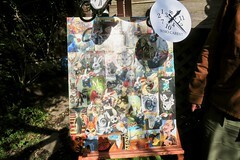 On the back, a clock with a bejeweled face and wings: time is precious, time flies. 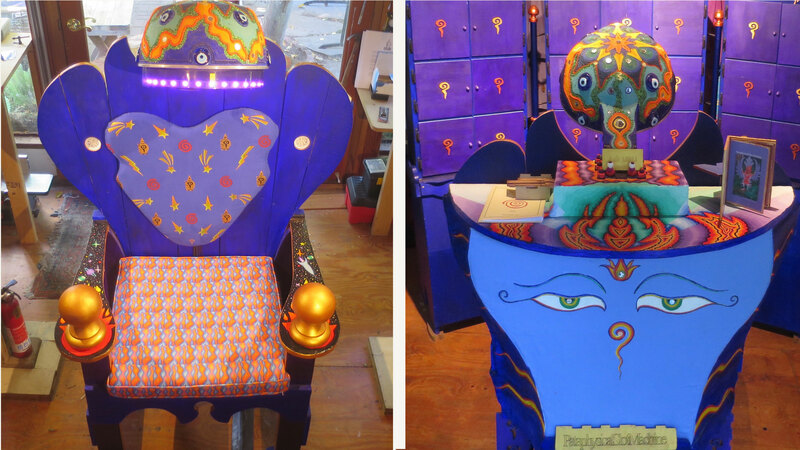 This wonderbox is a recreation of the set of “Ubu Roi,” the play by French poet Alfred Jarry that caused riots in the streets of Paris. The set was designed by Toulouse Lautrec and other friends of pataphysics. This wonderbox features Pere Heb, who is the oft-parodied teacher of young Jarry and his classmates. 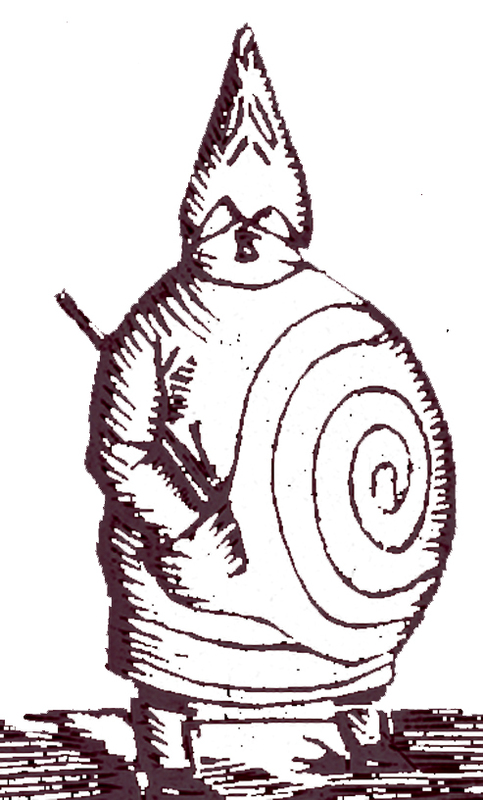 This figure morphed into Ubu, the main character of Ubu Roi — who is generally considered to be one of the most profane and bombastic figures in all of literature. This wonderbox features two figurines enraptured by the moving pictures on the wall, wasting away while they are forever consuming content. 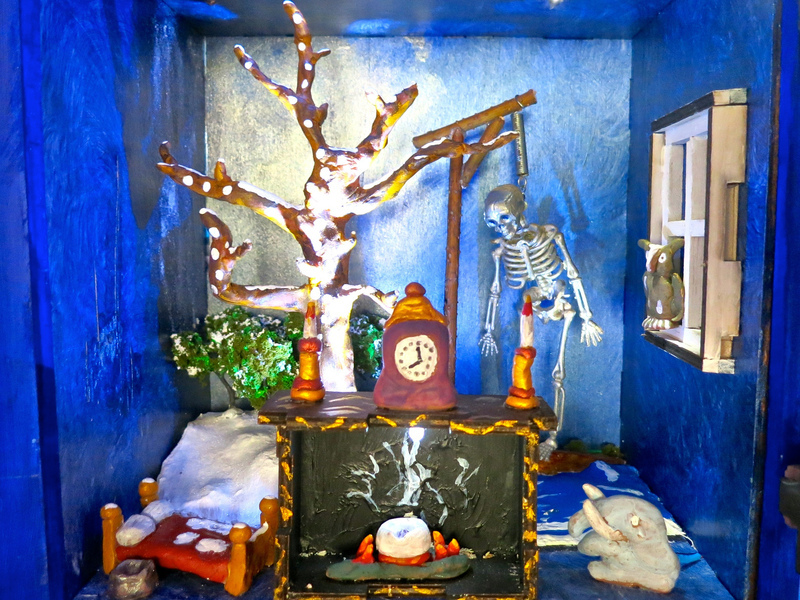 The materials are clay figurines, oil and canvas paintings, 1/12th scale doll house furniture and a Raspberry Pi computer driving a HD LCD screen. A skull with fiery eyes turns from side to side, saying “I can see into your mind in this vast and troubled world.” This art wonderbox was conceived, designed and built by Natalie Frederick, a 12-year old middle school student — with technical assistance from her mom, Jean Bolte and Pataphysical Studio members including Howard, Fabrice, Freddy, Tim, and Donald. It is powered by an Arduino Uno and a Teensie, using this code. See the video. 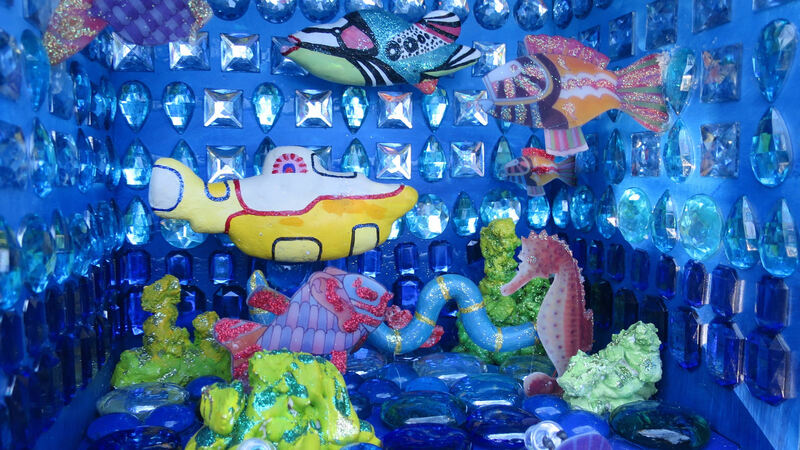 This wonderbox shows an underwater scene of sea animals and vessels, some of them featured in the movie, the Yellow Submarine. Background music is a mash-up of sound from the same movie. 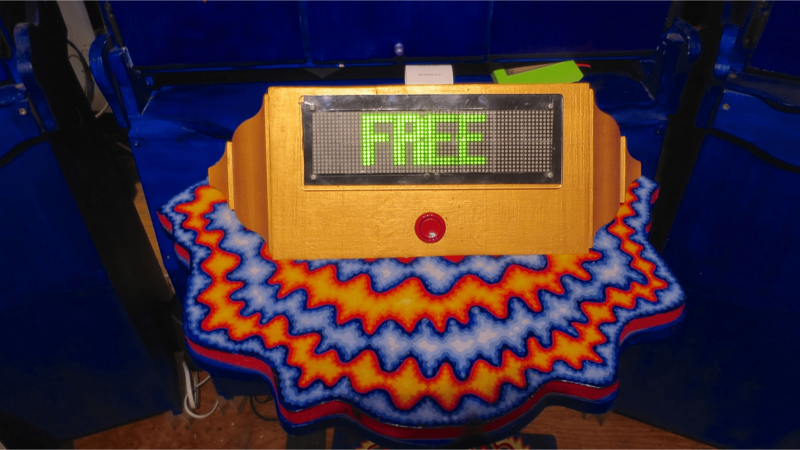 The wonder box contains 15 lights and is powered by an Arduino Uno. Dr. Really taught Dr. Tout d’Suite how to wire and solder LEDs; Dr. Pozar provided a diagram on how to use a barrier strip after the breadboard approach proved ineffective with so many lights. The heart of the ‘Pataphysical Slot Machine is an oracle controller that invites you to ask a question, then click a red button to get ‘instructions from the future’. A short three-word answer then scrolls by on an illuminated display (e.g. : ‘Embrace Purple Sky’). We hear a gong, then the oracle speaks his inscrutable words of wisdom with a thick french accent. We believe it to be the voice of Père Ubu, who now lives in the 22nd century, but kindly tweets back guidance to our guests, upon request. So you won’t forget, a printer spits out a receipt with the oracle’s words of advice. Fabrice designed and built the oracle controller, while Donald led the software engineering and Howard created the colorful desk that supports it. The technology behind this experience is now implemented with three different processors: a Sanguino processor picks the words at random and scrolls them on two large Sure 3216 LED displays (based on a modified WiseClock system from Florin Chiperi); a second Arduino Mega processor speaks the oracle’s words and plays sound effects, using an Adafruit Waveshield sound player; and a third Arduino Uno processor prints out your instructions from the future, using an Adafruit thermal printer. Learn more in our Wonderbox specs and in these schematics — and check out the code for each processor on our Github repository. 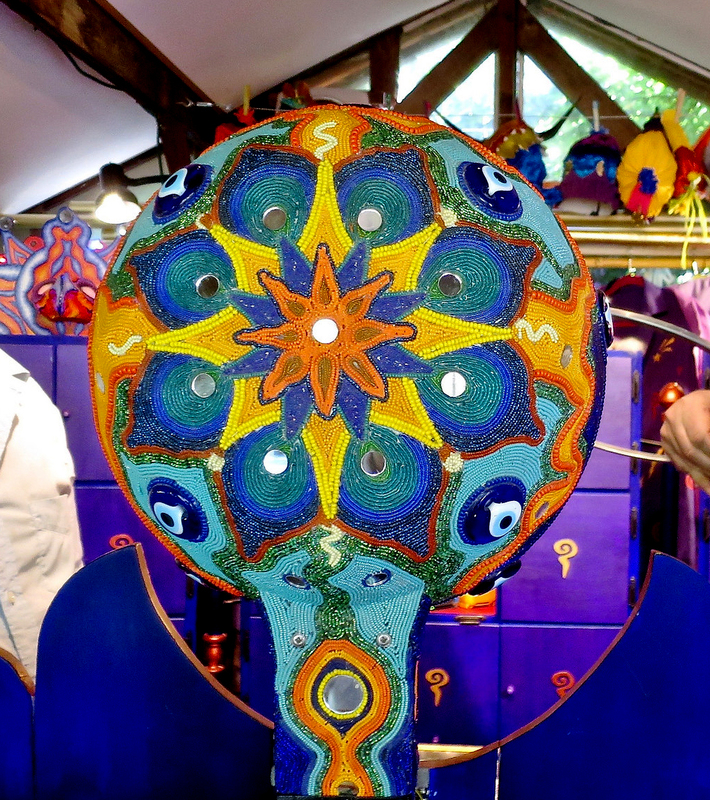 This beaded artwork was inspired by the Huichol Indians of Mexico, who produce very psyche-delic artwork after ritual ingestion of medicinal plants. This style is one of Stephanie’s, the artist’s, favorites, because of its bright colors and designs. It lends itself naturally to be paired with Dr Rindbrain’s paintings. 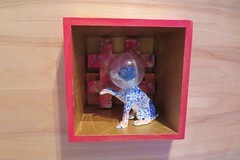 Wonderboxes are modular wooden boxes used to contain the artwork described above. We designed them to fit inside one of three ‘cabinets of curiosities’, to be opened after the visitors gets their oracle instructions. One of our design challenges was to make sure the boxes could easily be taken apart by the artists, then put back together quickly. Wonderboxes are typically made of 5 interlocking pieces of ¼” maple wood, which are now manufactured one at a time with a laser printer (see Illustrator files and instructions). The inside dimensions of standard wonderboxes are about 9.25″ wide x 9.25″ high x 6.75” deep. 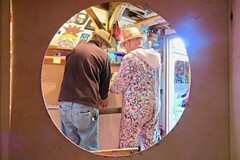 The Pataphysical Lab coats are used mainly for ritual purposes. We try to wear Pataphysical attire, in part or in full, whenever we meet. 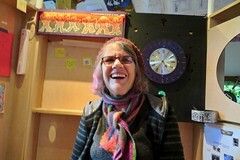 Our regalia has been further accessorized by the beautiful paper crowns created by Judy Rheingold (Dr. Judy). 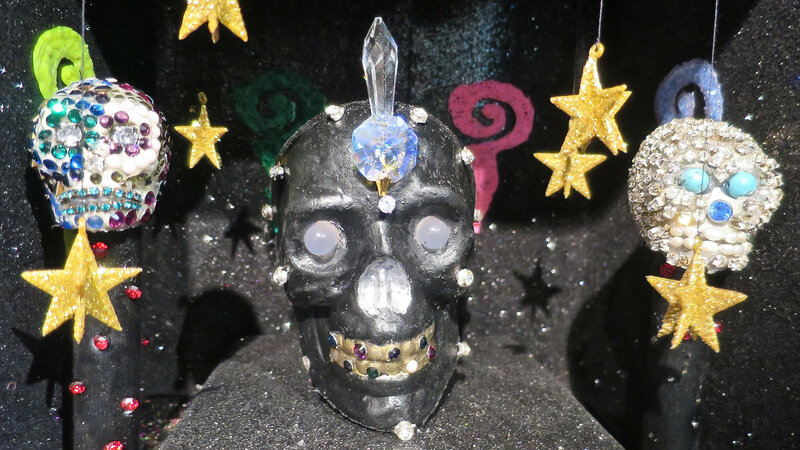 I have also created special badges and necklaces, symbolically tied to Pataphysics. Full regalia is required for ceremonies of accomplishment. 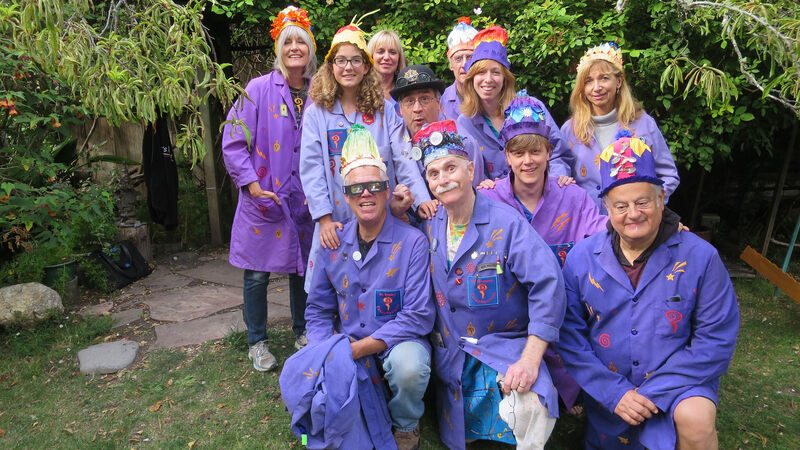 The Pataphysical Aprons are functional and used for warmer weather, when the lab coats are simply too hot to wear. 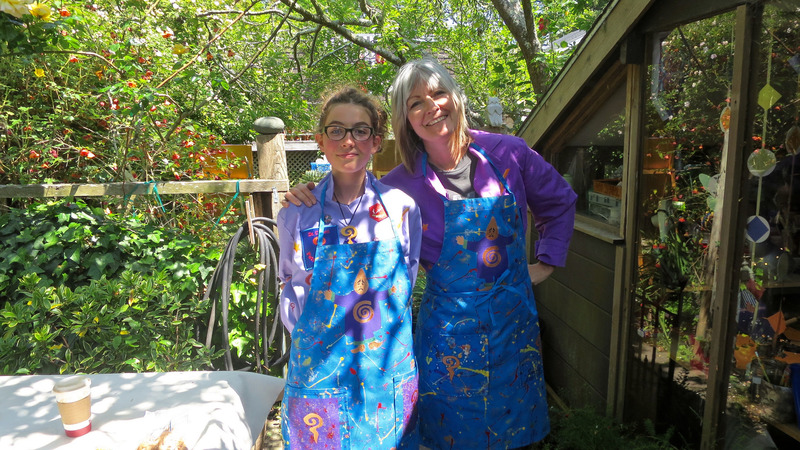 Each apron has Ubu Roi painted on it, so as to channel the Pataphysical spirit.